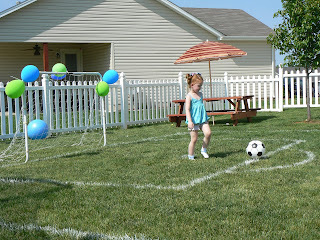 Crafty Little Beana: Carter's Soccer Party! Happy Birthday Sweet Carter Bug! 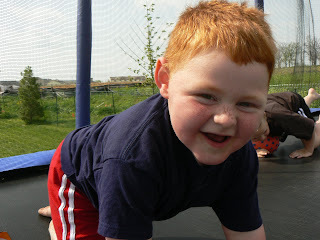 I guess I took better pictures with my sister's camera, but here are some shots of Carter's 3rd Birthday Party! 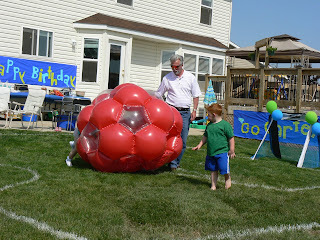 Carter loves soccer, so with that being the theme they set up a soccer field in their backyard! It was awesome the way my sister and brother-in-law decorated their yard for the party. The kids had a blast, and the adults must have too, because the party went well into the evening hours! 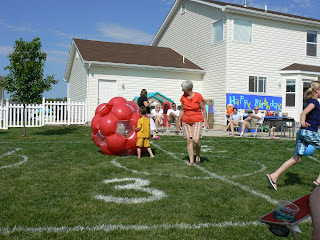 What a great idea to have a soccer party. Looks like lots of fun! As for the bubble dress...I love it, it went together very easily, and it fits absolutely true to size. Claire loves it...she has been wearing it everyday, which means late night laundry, which means I will be making several more of these cuties! It's bubbly, but not overdone...I love it, she loves it, and I think it was money well spent. What a fun party! And what a cute boy! Oh my goodness, how cute is he?!?! ?